The Dalmatian Stone appeals to the child within us all, fortifying the spirit and encouraging a sense of playfulness. It is particularly beneficial for those who are overly analytical, returning some of the intellectual carefulness back into the physical joy of simply being. It has a grounding energy, supportive of family and loyalty, and has a calming influence for children and animals. Dalmatian Stone, incorrectly called Dalmatian Jasper, is pale gray, cream or beige-brown stone made of feldspar and quartz. With black or brown spots of iron oxide, tourmaline, or other mineral inclusions that resemble the coat of a Dalmatian breed of dog. Known for its protective and healing properties, this mineral's vibrational energy is slow, though quite effective, and should be used long term. The determination within Dalmatian Stone encourages one to carefully think over plans for any project, reflecting on every phase of development, and then to translate the ideas into actuality with enthusiasm and vigor. It is an excellent talisman for the early stages of setting up a business or solo venture. An excellent anti-smoking crystal, Dalmatian Stone strengthens the resolve to quit smoking and provides the determination needed to succeed. Dalmatian Stone encourages fidelity and emotional harmony, strengthening family bonds and long-term friendships. It encourages team effort and cooperation at work. Children benefit on all levels from this beautiful stone, particularly at night to assure safe sleep and in preventing dreams of monsters and other nightmares. 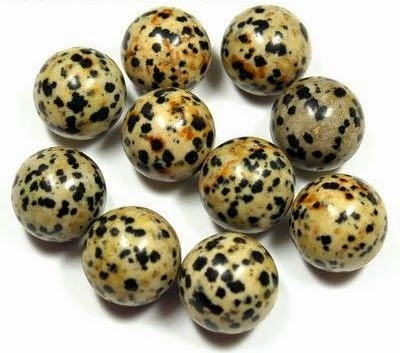 As a Jasper whose properties reflect its appearance, Dalmatian Stone is remarkably successful for calming, training and healing pets, especially dogs. It is the perfect crystal to assist in turning your love of dogs into a profession, such as breeder, trainer, or handler in any field, and for those who rescue injured or abandoned animals. It also assists in the ability to overcome an irrational fear of dogs. 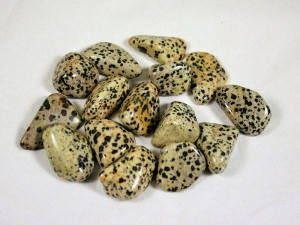 Dalmatian Jasper supports the body’s physical balance and is a great stone for those who engage in the martial arts, tai chi, or chi gung. Its ability to balance yin-yang energy helps one capture the essence of this art for good health and well-being. Dalmatian Stone stimulates the nerves and reflex actions, and is beneficial to the muscles, tendons and cartilage. It also helps prevent strains, sprains and muscle spasms. It is thought to boost the immune system and remove toxins, and to assist with bowel disorders, particularly IBS and constipation. It is also useful in the treatment of skin problems and allergic rashes. If life has become burdensome and all sense of joy seems to be lost, wearing or carrying a Dalmatian Stone can reawaken a sense of fun and humour. It has a fortifying, restorative and emotionally harmonizing effect, counteracting disillusion, cynicism and scepticism. Its Tourmaline inclusions quickly dissipate negative energy and outworn patterns, moving you forward in life. 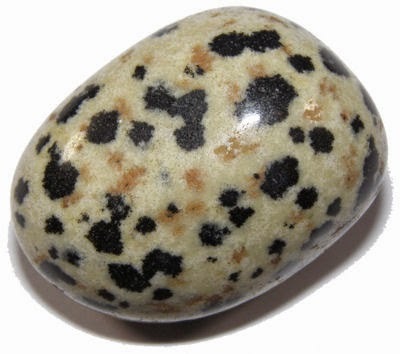 Dalmatian Stone opens the Base, Sacral and Earth Chakras, grounding and assisting one in coming to terms joyfully with being in incarnation. The Base, or Root Chakra, is located at the base of the spine, and controls the energy for kinaesthetic feeling and movement. It is the foundation of physical and spiritual energy for the body. When the Base Chakra is in balance, the physical body gains strength and stamina, and spiritual energy is rekindled in the form of security and sense of one's own power. It often leads to independence and spontaneous leadership. The Sacral Chakra, or Second Chakra, is located below the naval and above the pubic bone at the front of the pelvis. It controls the flow of energy and is the center of gravity and Life Force of the body. The Earth Chakra is located between and slightly below the feet. It holds the soul into carnation and creates a solid connection to the planet Earth, allowing excess and out-of-balance energies to flow from the body. Dalmatian Stone strengthens the spirit and provides a physicality to the soul. It reminds us we are spiritual beings on a human journey and to joyfully embrace our incarnation while we are here.